Kevin Spacey's passion for Beyond the Sea is commendable. 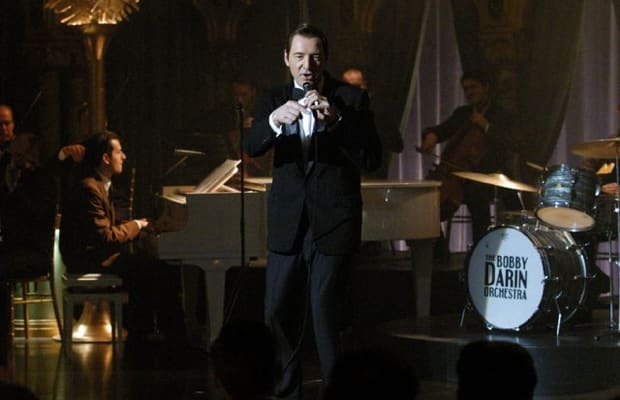 In addition to directing the picture, Spacey also co-wrote the script and tackled the leading role, of legendary singer Bobby Darin, who topped charts and participated in politics before dying at the young age of 37 after a heart operation. Obviously a huge fan of Darin's, Spacey puts his all into the film, even singing the entire soundtrack himself in his best Darin impersonation. But that's also the issue here: Beyond the Sea is little more than a paint-by-numbers mimicking of the entertainer's performances surrounded by middling character development. Once Beyond the Sea is over, all that's learned about Darin is that he dreamed of being bigger than Frank Sinatra and wanted to make his mother proud. Which, yes, describes just about every guy who's ever sang a single note over the last 50 years.